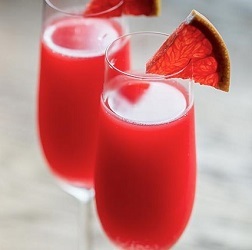 I have no experience in making wine cocktails and I would like a recommendation of a "rose" colored wine cocktail. The wine cocktail I am looking for should be as close as possible to the color rose as possible. The color pink is generally much lighter in color than that of rose. Rose is the color halfway between red and magenta. Pink is a pale red color which takes its name from the flower of the same name. If possible could answers include why one is making their recommendations, a recipe for usage and an image of the suggested wine cocktail or wine cocktails (if possible). 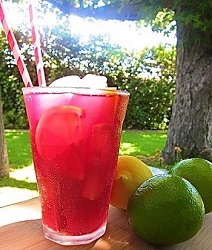 I do love a wine spritzer and cocktails, as you can take a fabulous wine, white or red, add splashes of other liquid(s) for a light and refreshing drink. I also love your questions, and would like to be your neighbor, invited over for drinks (I'll bring the hors d'oeuvres). So, for your glorious rose-colored beverages, along with rosy images! Traditional-flavored gaseosa can be replicated by mixing Sprite or 7-Up with carbonated water. 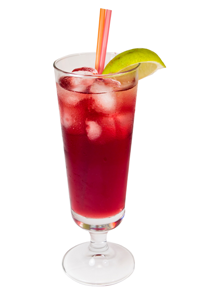 In a highball glass half-filled with ice, add orange liqueur, lime juice and red wine. Swirl gently to mix and then add soda. Garnish with orange wedge or lime twist. Serves one. Add sugar, lemon juice to you preferred glass and muddle until sugar dissolves. Add ice, wine and the lemonade to fill. Garnish with lemon slice or cherry. Add the room-temperature Crème de Cassis to the glass first, followed by the wine (otherwise, they do not mix very well or uniformly). 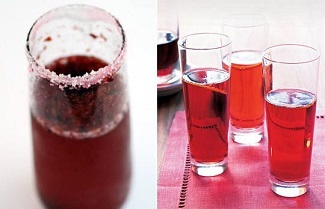 Add the cherries to the bottom of an 8-oz glass, followed by 1-oz cherry brandy. 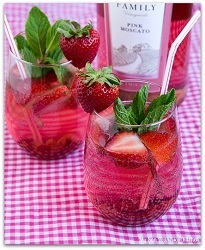 Divide the moscato into each glass, and drop the sliced strawberries and mint on top. Garnish with a fresh strawberry on the side of the glass and serve chilled. Makes 2 cocktails. 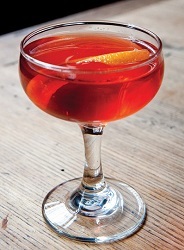 Strain into a chilled cocktail glass and twist a thin-cut swatch of orange peel over the top. Not the answer you're looking for? Browse other questions tagged wine recommendations ingredients cocktails or ask your own question.